Landscaping ties add a clear edge to your flower or planting bed, adding definition to your garden and preventing grass from growing into your beds. Names: Railroad ties, landscape timber, landscaping timbers. Description: New wooden landscaping ties in two sizes and various standard lengths. Size: 4″ x 4″ ties are available in lenghts of 8′, 10′ and 12′. 6″ x 6″ ties are also available in lenghts of 8′, 10′ and 12′, as well as 16′ and 20′ lengths. Delivery: We are able to deliver all bulk material, landscape ties, mulch, aggregate stone and decorative stone to NJ, PA & NY. Delivery charges are a function of the type of materials, the volume of materials, as well as the distance (from our Pennington, NJ location) to your site. Please phone us and we can discuss the particulars of your needs. For more information about pricing and delivery of landscape ties, please contact us. 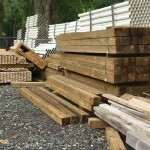 Gregs Landscaping supplies Landscape TiesBulk delivery of landscape ties is available in New Jersey, Pennsylvania, and New York. Free delivery for qualifying orders*.